Detox Dark Chocolate Almond Butter Cups ~ a healthy snack or dessert just like your favorite peanut butter cup, but better for you! Put 1 bag of chocolate chips in a microwave safe bowl and microwave on full power for a minute. Stir, and if the chocolate is not completely melted, microwave for further short 15 second bursts until it is completely melted. Spoon about 1 1/2 tablespoons of chocolate into each of 12 cupcake wrapper molds. 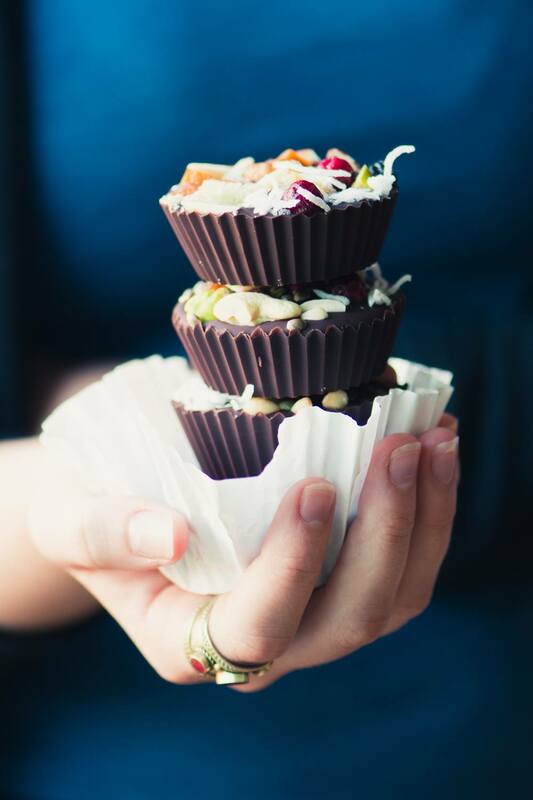 Nudge the chocolate up the side of the wrapper about 1/2 – 3/4 of an inch, to form the sides of the cup. Refrigerate until firm. Spoon about a tablespoon of almond butter into the bottom of each hardened chocolate cup. Spread it flat. Melt the remaining bag of chocolate in the same bowl (there will be some remaining melted chocolate left in the bowl, that's fine.) Working in batches, spoon enough melted chocolate onto each cup to cover the peanut butter. Arrange your toppings over the surface of each cup. Refrigerate again until the chocolate is firm.